Dahua’s DH-IPC-PFW8802-A180 is a multi-sensor panoramic infrared (IR) bullet network camera for capturing wide-area video surveillance. With four 2 megapixel sensors working in tandem to create a comprehensive 180-degree overview, the camera can replace multiple single-sensor cameras, providing a higher return on investment. 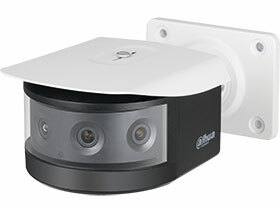 With the field of view divided across the four sensors, adjustments can be made to each sensor for contrast and brightness, resulting in clear panorama images. With IR illumination, detailed images can be captured in low light or total darkness. The camera’s Smart IR technology adjusts the intensity of the infrared LEDs to compensate for the distance to an object. Smart IR technology also prevents the IR LEDs from whitening out images as they come closer to the camera. The camera is equipped with a built-in intelligent analytics algorithm which can offer intelligent functions like tripwire, intrusion, abandoned and missing objects and so on, to accurately respond to monitoring events in a specific area. In addition, the IP67 and IK10 rated camera supports intelligent tamper detection, which generates a warning message when detecting a dramatic scene change.